Jumping late on the Valentine’s Day baking band wagon this year, I am sharing a delicious and pretty tart recipe. This recipe was inspired by a recent plated dessert I made for an event at my workplace – the cassis hazelnut bostock with mascarpone cream, candied hazelnuts, and fresh blackberries. Catering events also means there are lots of leftover ingredients because it is always better to over-prepare than under-prepare, so I took home some hazelnut frangipane to play with. 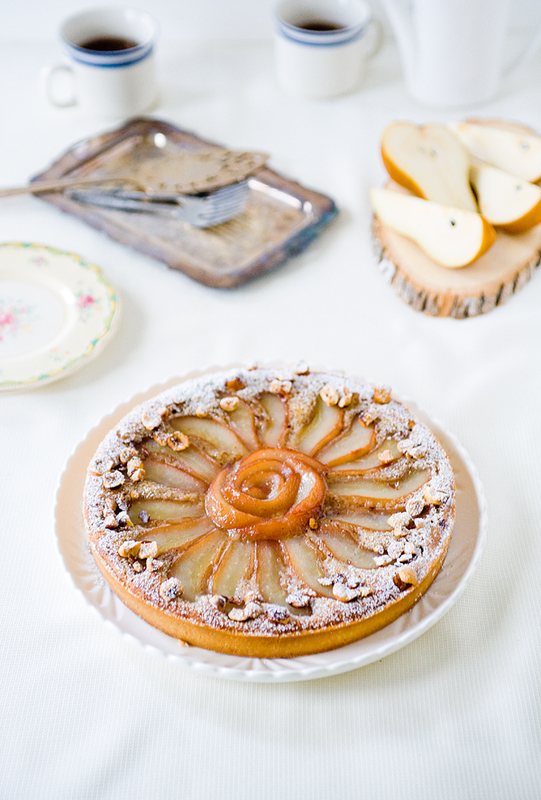 This dessert is a twist on the classic pear almond tart. My co-worker and I drooled over the idea of a cassis poached pear hazelnut tart as we talked about the things we can make with the leftovers. Nutty cream and fruit in a tart shell never gets old, there can be endless combinations – orange hazelnut, pear walnut, and berry almond are some of my favourites. 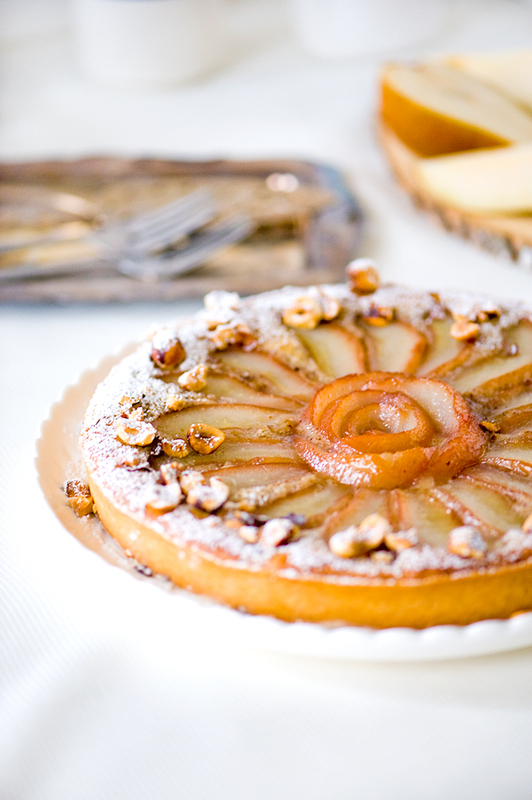 Time to add another favourite: the crème de cassis pear hazelnut tart. Slice poached pear quarters into 3-4 slices and arrange onto filled shell. Bake in preheated oven for 20-30 minutes until it is golden around the edges. 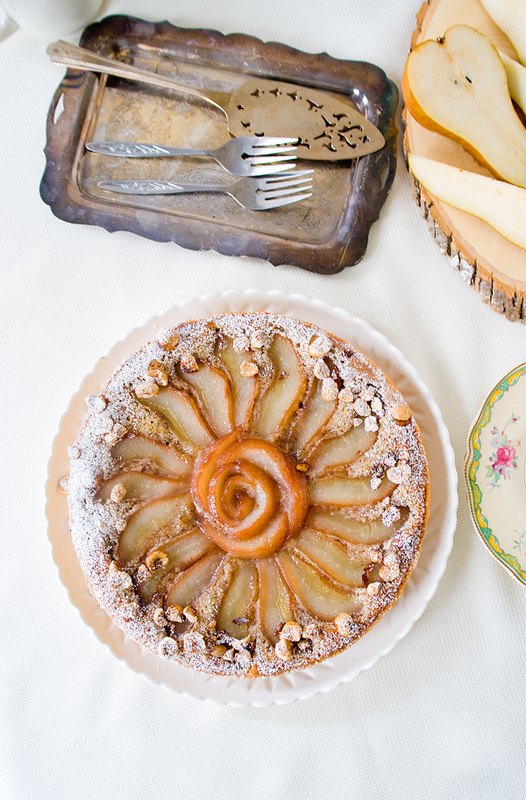 Once cool, garnish edges with hazelnuts, and dust with icing sugar. Cassis is also known is black currant. It was one of my favourite candy flavours when I was young. I recently discovered crème de cassis on a trip to the liquor store. I experimented with adding it into my pot of blueberry jam and something magical happened. The jam was made so much better as the flavours complemented each other so well, the liqueur added depth and complexity to the otherwise quite monotone jam. I was pleasantly surprised, my aunt who tasted it was so impressed. Ripened pears has such a nice mild floral flavour, and the black currant liqueur adds a distinct fruitiness. The poached fruit is so juicy and velvety that made the hazelnut filling even more creamy. I also like the contrast of the colour of the liqueur with the white pear flesh. You can get creative with the arranging and style, and no Valentine’s day is complete without some kind of flower hence the pear rose in the center. So on this Valentine’s day, say I love you with this lovely tart instead of chocolates!